Kathy Goodman is assistant professor of student affairs in higher education at Miami University. She earned her Ph.D. at the University of Iowa in May 2011. Her dissertation, The Influence of the Campus Climate for Diversity on College Students' Need for Cognition, focused on relationship between diversity and learning. While at Iowa, she was a research assistant at the Center for Research on Undergraduate Education. Prior to that, she held an administrative position at the Association of American Colleges and Universities. Kathy’s research and teaching interests include the impact of college experiences on student development; diversity and equity in higher education; spirituality, life purpose, and atheist college students; and incorporating critical perspectives into quantitative research. She has been published in the Journal of College Student Development, the Journal of Mixed Methods Research, The Chronicle of Higher Education, Diversity and Democracy, and Research in Higher Education. She has also served as member of the board of directors for the Secular Student Alliance. Co-instructor with Dr. Ernest Pascarella. Instructor under the supervision of Dr. Sherry Watt. Teaching Assistant for Dr. Paul Umbach. Teaching Assistant for Dr. Sherry Watt. Instructor under the supervision of Brian Corkery. Participated as staff member for 14 months, assisting with recruitment, providing intercultural and leadership trainings, program planning, and mentoring ten students. Associate Director of Marketing and Conference Program Associate. Promoted memberships, conferences, journals, and monographs through print and web. Planned conference speakers and topics, facilitated conference sessions, and managed on-site logistics. Diversity Initiative Intern. Assisted campus-wide diversity committee by organizing meetings, taking notes, and researching diversity-related resources. Planned day-long college visit for third graders who might not otherwise be exposed to college. Organized speakers to talk to third graders at their school. Program Assistant for the Collegiate Science and Technology Entry Program for 16 months. Organized resources for students, wrote newsletters, coordinated meetings and workshops, maintained database, and assisted students who visited or called the office. Writing, desktop publishing, and computer consultant for four years for clients in academic and student services, affirmative action, alumni and college relations, arts council, academic computing, continuing education, and public archaeology. Phonathon Coordinator for college annual fund for four years. Wrote campaign letters and scripts, organized alumni mailings, trained student callers, tracked pledges, and supervised calling sessions. One of a select group of scholars nominated to participate in a program dedicated to evaluating policy-relevant research based on my emerging body of research and interests. In recognition of exemplary research and poster presentation. In recognition of outstanding contribution and achievement in diversity research. Dissertation proposal was chosen, by a committee of senior scholars in the social sciences, as one of 47 finalists (out of 600 applicants) in recognition of outstanding potential. Presented for commitment to international programs and volunteer work with international students. National award for academic achievement. Competitive grant presented by the Midwestern Higher Education Compact to attend a policy summit on the Spellings Commission Report. Presented by the Iowa Student Personnel Association in recognition of my accomplishments as a graduate student in the field of student affairs. Funded to work with my professor to develop Mystery Fossil -- software that allowed students to explore human fossils and physical anthropology in a virtual laboratory. Inducted into the National Collegiate Honors Society for Anthropology while at Potsdam College. Goodman, K. (revision under review). The effects of viewpoint diversity and racial diversity on need for cognition within four racial groups. Goodman, K. (in progress). An exploratory study of atheist college students’ spirituality. Goodman, K., Martin, G., Reams, A., & Pascarella, E. (in progress). Discerning alcohol’s negative effects on liberal arts outcomes in the first year of college. Stinson, R. D., Goodman, K. M., Bermingham, C., & Ali, S. R. (2013). Do atheism and feminism go hand-in-hand? A qualitative investigation of atheist men's perspectives about gender equality. Secularism and Nonreligion, 2, 39-60. Seifert, T., Goodman, K., King, P., & Baxter Magolda, M. (2010). Using mixed methods to study first-year college impact. Journal of Mixed Methods Research, 4(3), 248-267. Seifert, T., Pascarella, E., Goodman, K., Salisbury, M., & Blaich, C. (2010). Liberal arts colleges and good practices in undergraduate education: Additional evidence. Journal of College Student Development, 51(1), 1-22. Seifert, T., Goodman, K., Lindsay, N., Jorgensen, J., Wolniak, G., Pascarella, E., et al. (2008). The effects of liberal arts experiences on liberal arts outcomes. Research in Higher Education, 49(2), 107-125. Pascarella, E., Goodman, K., Seifert, T., Tagliapietra-Nicoli, G., Park, S., & Whitt, E. (2007). College student binge drinking and academic achievement: A longitudinal replication and extension. Journal of College Student Development, 48(6), 715-727. Watt, S., Fairchild, E., & Goodman, K. (Eds.). (2009). Religious privilege and student affairs practice: Intersections of difficult dialogues. New Directions for Student Services, 2009(125). Goodman, K. M., Wilson, K., & Nicolazzo, Z. (2015). Campus practice in support of spirituality, faith, religion, and life purpose: What’s been accomplished and where do we go next? In J. Small (Ed.) Making Meaning: Embracing Spirituality, Faith, Religion, and Life Purpose in Student Affairs (pp. 118-140). Sterling, VA: Stylus. Goodman, K. M. (2014). The future of spirituality in higher education: Becoming more inclusive. In P. A. Sasso & J. DeVitis (Eds.) Today’s college students: A reader (pp. 257-266). New York, NY: Peter Lang Press. Goodman, K. M. (2012). Deliberate campus practices to foster spirituality, purpose, and meaning: Recognizing student characteristics and group differences. In A. N. Bryant Rockenbach & M. J. Mayhew (Eds.) Spirituality in college students’ lives: Translating research into practice (pp. 57-66). New York, NY: Routledge. Seifert, T. A., Pascarella, E. T., Erkel, S. I., & Goodman, K. M. (2010). The importance of longitudinal pretest-posttest designs in estimating college impact. New Directions for Institutional Research, 2010(S2), 5-16. Goodman, K., & Mueller, J. (2009). Invisible, marginalized, and stigmatized: Understanding and addressing the needs of atheist students. New Directions for Student Services, 2009(125), 55-63. Padgett, R., Goodman, K., Johnson, M., Saichaie, K., Umbach, P., & Pascarella, E. (2010). The impact of college student socialization, social class, and race on need for cognition. New Directions for Institutional Research, 2010(145), 99-111. Goodman, K. M., Magolda, M. B., Seifert, T. A., & King, P. M. (2011). Good practices for student learning: Mixed-method evidence from the Wabash National Study. About Campus, 16(1), 2-9. Goodman, K., & Mueller, J. (2009, January 30). Atheist students on campus: From misconceptions to inclusion. The Chronicle of Higher Education, p. A64. Seifert, T., Goodman, K., & Harmon, N. (2009). Methods for assessing inner development: Spirituality and beyond. Journal of College and Character, 10(7), 1-5. Salisbury, M., & Goodman, K. (2009). Educational practices that foster intercultural competence. Diversity & Democracy, 12(2), 12-13. Goodman, K., & Teraguchi, D. (2008). Beyond spirituality: A new framework for educators. Diversity & Democracy, 11(1), 10-11. Goodman, K., & Pascarella, E. (2006). First-year seminars increase persistence and retention: A summary of the evidence from How College Affects Students. Peer Review, 8(3), 26-28. Goodman, K. (2003). The class is half empty: Report supports class-based affirmative action. Diversity Digest, 7(3), 12-13. Goodman, K. (2004). [Review of the book Women without class: Girls, race, and identity]. On Campus With Women, 33(2). Goodman, K. (2010, February). The Effects of Good Practices on Liberal Arts Outcomes: An Analysis of Three Cohorts of WNSLAE Data. Report prepared for project manager, Charles Blaich. Iowa City, IA: Center for Research on Undergraduate Education. Pascarella, E., Whitt, E., Goodman, K., Park, S., Seifert, T., & Tagliapietra-Nicoli, G. (2006, September). Undergraduate experiences and outcomes at The University of Iowa. Report of Research on Iowa Student Experiences (RISE). Iowa City, IA: Center for Research on Undergraduate Education. Seifert, T., Goodman, K., Pascarella, E., Tagliapietra-Nicoli, G., & Whitt, E. (2006, January). Effects of select college experiences on first-year college outcomes, satisfaction, and success at The University of Iowa. Report prepared for Provost, Michael Hogan. Iowa City, IA: Center for Research on Undergraduate Education. Goodman, K. (2016, April). Bringing student affairs to the interfaith party. Preconference workshop presented at the Illinois Interfaith Conference, Champaign, IL. Robinson, K. & Goodman, K. (2016, March). Using learning partnerships to enhance co-teaching between student and academic affairs personnel. Workshop presented at the annual conference of NASPA, Indianapolis, IN. Goodman, K. (2016, March). Lessons from a pilot study on students’ religious, spiritual, and secular pathways to purpose. Research presentation at the annual conference of NASPA, Indianapolis, IN. Goodman, K. & Small, Jenny (2015, October). Spiritual, religious, and secular pathways to purpose in a global society. Workshop presented at the Global Learning in College conference of the Association of American Colleges and Universities, Fort Lauderdale, FL. Goodman, K. (2015, January). Spirituality and liberal education: Possibilities and provocations to become more inclusive. Seminar session at the annual conference of the Association of American Colleges and Universities, Washington, DC. Goodman, K. (2014, November). Secular students and spirituality. Research presentation at the annual conference of the Nonreligion and Secularity Research Network, Los Angeles, CA. Goodman, K. (2014, April). Getting to know atheist college students: An exploratory study. Research poster presented at the annual convention of the American College Personnel Association, Indianapolis, IN. Small, J. et al. (2014, April). Making meaning: How student affairs came to embrace spirituality/faith/religion/life purpose. Extended workshop presented at the annual convention of the American College Personnel Association, Indianapolis, IN. Goodman, K., Caceras, C., & Mueller J. (2014, March). Faitheism: Fostering interfaith conversations that include atheists and agnostics. Workshop presented at the annual convention of the American College Personnel Association, Indianapolis, IN. Goodman, K. (2014, March). The power of integrative learning: From research to practice. Poster presented at the Diversity & Learning conference of the Association of American Colleges and University, Chicago, IL. Robinson, K. & Goodman K. (2014, January). Facilitating integrative learning through student affairs and academic affairs collaborations and beyond. Workshop presented at the annual conference of the Ohio College Personnel Association, Worthington, OH. Goodman, K. & Mueller, J. (2013, July). Recent Findings from Higher Education Research. Speech presented at the annual conference of the Secular Student Alliance, Columbus, OH. Goodman, K. (2013, March). Creating Inclusive Campuses for Atheist Students: What Can We Learn from Student Affairs and Research? Speech presented at the second annual Freethought Festival, Madison, WI. Goodman, K. (2012, July). Making campus more non-religious friendly: What can be gleaned from student affairs perspectives and research about atheists? Speech presented at the annual conference of the Secular Student Alliance, Columbus, OH. Goodman, K. (2012, April). Understanding atheists and including them in interfaith initiatives. Roundtable presented at the Illinois Conference on Interfaith Collaboration, Urbana-Champaign, IL. Mueller, J., & Goodman, K. (2012, March). Atheist college students: Voices, experiences, and insights. Panel presentation at the annual convention of the American College Personnel Association, Baltimore, MD. Small, J. & Goodman, K. (2012, March). 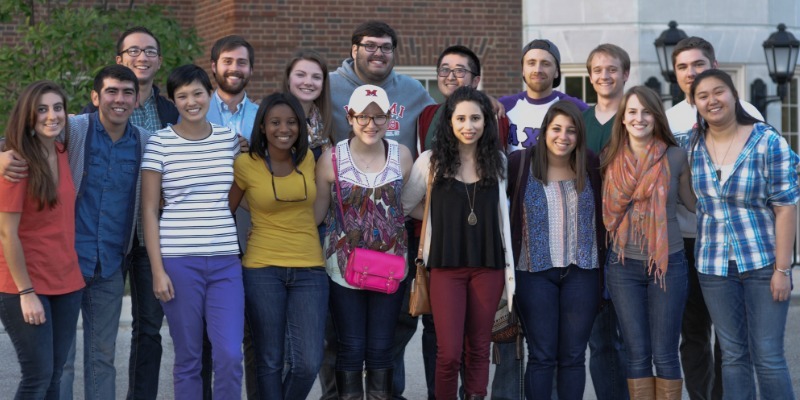 Atheist college students: Faith, spirituality, and meaning Making. Online webinar presented by the American College Personnel Association. Christman, H, & Goodman, K. (2011, November). The Impact of Classroom Practices on Students’ Socially Responsible Leadership. Paper presented at the annual meeting of the Association for the Study of Higher Education, Charlotte, NC. Goodman, K. (2011, May). The Influence of the Campus Climate for Diversity on College Students’ Need for Cognition. Paper presented at the annual forum of the Association for Institutional Research, Toronto, ON. Stinson, R. D., Bermingham, C., Goodman, K. M., & Ali, S. R. (2011, April). The gender role beliefs of atheist men: An exploratory qualitative investigation. Poster presented at the Spring Conference of the Iowa Psychological Association, Dubuque, Iowa. Seifert, T., Goodman, K., Salisbury, M., & Pascarella, E. (2011, March). Increasing students’ experiences of good practices: Liberal arts college lessons. Paper presented at the annual convention of the American College Personnel Association, Baltimore, MD. Goodman, K., & Mueller, J. (2011, March). Good without God: A book group discussion. Workshop presented at the annual convention of the American College Personnel Association, Baltimore, MD. Mueller, J., & Goodman, K. (2011, March). Atheist college students and the secular student movement. Roundtable presented at the annual convention of the American College Personnel Association, Baltimore, MD. Goodman, K., & Seifert, T. (2010, March). Interrogating privilege: Religious and spiritual worldviews on campus. Workshop presented at the annual convention of the American College Personnel Association, Boston, MA. Mueller, J., & Goodman, K. (2010, March). Atheist college students and the secular student movement. Roundtable presented at the annual convention of the American College Personnel Association, Boston, MA. Goodman, K. (2010, January). Race, socioeconomic status, diverse campus environments, and college students’ need for cognition. Poster presented at the University of Iowa College of Education Martin Luther King Jr. Research Symposium, Iowa City, IA. Goodman, K. (2009, November). Does diversity impact all students equally? A critical quantitative analysis of the effects of diversity, race, and class on first-year students' need for cognition. Paper presented at the annual meeting of the Association for the Study of Higher Education, Vancouver, BC. Goodman, K., & Mueller, J. (2009, August). Atheist students in a college setting. Presentation at the annual meeting of the Secular Student Alliance, Columbus, OH. Goodman, K., & Salisbury, M. (2009, April). Activities and practices that promote intercultural effectiveness in college. Paper presented at the annual meeting of the American Educational Research Association, San Diego, CA. Goodman, K. (2009, January). How is liberal education addressing the needs of atheist students? Presentation at the annual meeting of the Association of American Colleges and Universities, Seattle, WA. Watt, S., Harmon, N., Linley, J., Mindrup, K., Stinson, R., Venzon, M., Goodman, K., & Bagheri, E. (2009, October). Exploring privilege: Student reactions to racism, heterosexism, and ableism. Paper presented at the annual meeting of the Iowa Student Personnel Association, Cedar Rapids, IA. Seifert, T., Goodman, K., King, P., & Baxter Magolda, M. (2009, April). Using mixed methods to study college impact. Roundtable paper presented at the annual meeting of the American Educational Research Association, San Diego, CA. Creamer, E., King, P., Holsapple, M., Goodman, K., Seifert, T., Pizzolato, J., et al. (2009, April). Developments in measuring self-authorship. Symposium presented at the annual meeting of the American Educational Research Association, San Diego, CA. Goodman, K., Martin, G., Reams, A., & Pascarella, E. (2008, November). New evidence on the link between alcohol use and college outcomes. Paper presented at the annual meeting of the Association for the Study of Higher Education, Jacksonville, FL. Goodman, K., & Salisbury, M. (2008, October). High-impact educational activities: Do they promote intercultural effectiveness? Poster presented at the diversity and learning meeting of the Association of American Colleges and Universities, Long Beach, CA. Goodman, K., & Jorgensen, J. (2008, February). An update and replication: How do race and socioeconomic background influence experiences of good practices in undergraduate education? Poster presented at the The University of Iowa College of Education Martin Luther King, Jr. Research Symposium, Iowa City, IA. Padgett, R., Goodman, K., Johnson, M., Saichaie, K., & Umbach, P. (2008, November). The impact of college student socialization and socioeconomic factors on cognitive outcomes. Paper presented at the annual meeting of the Association for the Study of Higher Education, Jacksonville, FL. Seifert, T., Pascarella, E., Goodman, K., Salisbury, M., & Blaich, C. (2008, November). Liberal arts colleges and good practices in undergraduate education: Additional evidence. Paper presented at the annual meeting of the Association for the Study of Higher Education, Jacksonville, FL. Goodman, K. (2007, November). The impact of out of classroom experiences on college student development. Paper presented at the annual meeting of the Association for the Study of Higher Education, Louisville, KY.
Goodman, K., & Pascarella, E. (2007, November). College student binge drinking and academic achievement: A longitudinal replication and extension. Paper presented at the annual meeting of the Association for the Study of Higher Education, Louisville, KY.
Goodman, K., & Seifert, T. (2007, October). Engaging students in inclusive dialogues about “Big Questions”: Spirituality, religion, and beyond. Workshop presented at the annual meeting of the Iowa Student Personnel Association, Davenport, IA. Goodman, K. (2007, March). The impact of out of classroom diversity experiences on student development. Poster presented at the The University of Iowa College of Education Martin Luther King, Jr. Research Symposium, Iowa City, IA. Goodman, K., Jorgensen, J., Laskowski, J., Seifert, T., & Blaich, C. (2007, January). How do race and socioeconomic background influence experiences of liberal education and good practices in undergraduate education? Presentation at the annual meeting of the Association of American Colleges and Universities, New Orleans, LA. Seifert, T., Goodman, K., Edvalson, S., Laskowski, J., Pascarella, E., & Blaich, C. (2007, November). Why longitudinal research is critical in studying college impact: An example of between-college effects. Paper presented at the annual meeting of the Association for the Study of Higher Education, Louisville, KY.
Seifert, T., Goodman, K., & Lindsay, N. (2007, June). The effects of liberal arts experiences on liberal arts outcomes. Paper presented at the annual meeting of the Association of Institutional Researchers, Kansas City, MO. Park, S., & Goodman, K. (2007, March). The effects of financial aid and academic achievement on college student persistence at public institutions. Paper presented at the annual meeting of the Midwest Sociological Society, Chicago, IL. Goodman, K., Seifert, T., Jorgensen, J., Wolniak, G., Pascarella, E., Blaich, C., et al. (2006, November). How do race and socioeconomic background influence experiences of good practices in undergraduate education? Paper presented at the annual meeting of the Association for the Study of Higher Education, Anaheim, CA. Goodman, K. (2006, October). Atheism on campus and the growing focus on spirituality: Seeking a framework for inclusivity. Poster presented at the diversity and learning meeting of the Association of American Colleges and Universities, Philadelphia, PA.
Whitt, E., Guentzel, M., Goodman, K., Tagliapietra-Nicoli, G., & Seifert, T. (2006, March). Pursuing doctoral education: Exploring the right approach for you. Presentation at the annual meeting of the American College Personnel Association, Indianapolis, IN.